Ramen rules the roost in our house. I bet we make it twice a week. It is a dish everyone in our family will like and slurp up. I rarely hear grunts, moans or words of displeasure of what we are having for lunch or dinner on these nights. Our recipe for this dish is simple. 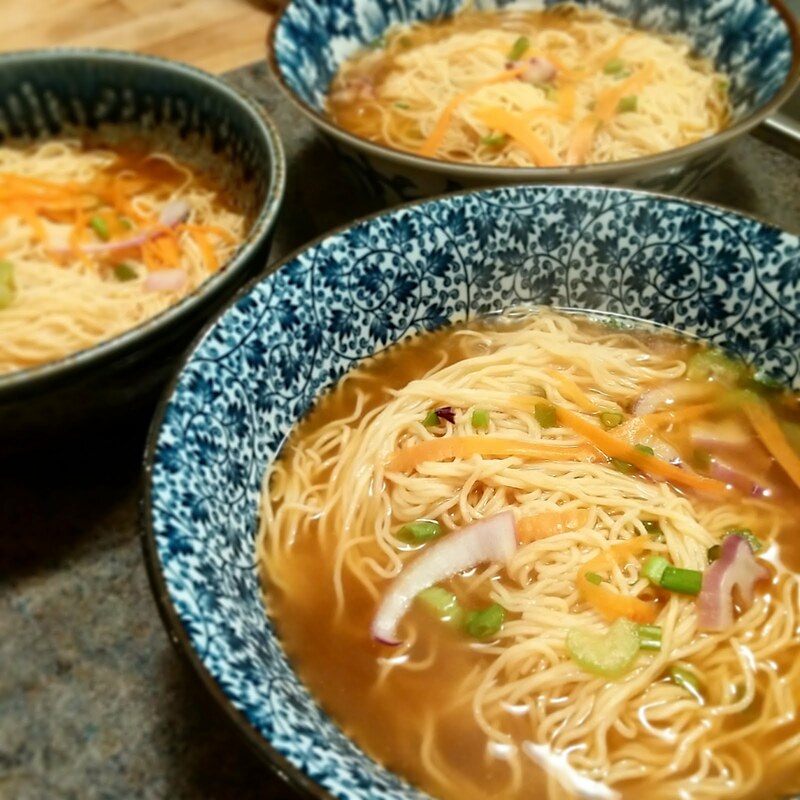 We use Japanese ramen noodles that I buy from Mai's (our local asian store in town) and use a vegetable broth seasoned with Tamari Sauce (gluten free soy sauce). I have also thrown in a spoonful of miso soup base for added flavor. We include carrots, green onion, red onion and mushrooms. We have also added: zucchini, hard boiled eggs, meat (if our guest eat meat), and celery. Honestly, you can add anything you want to your ramen bowl. The broth is a blank canvas and you can fill it up with what your family enjoys. Make it your own. This is just what we do because its quick and makes the kids happy. The kids don't want fancy or sophisticated. It took me a while to figure this out but I am finally catching on to this whole parenting thing....kind of. In fact, we eat ramen so much in our house during these cold and rainy days that I invested in a set of Ramen bowls. I love them. I tried to buy them all a bit different. I love how they all work together with their own vibrant patterns showing off their own ramen noodles. I paid about $14.00 a piece for them. I have no idea if this is a good deal or not...but, they have been used a ton in the last month we have owned them. A few weeks ago Cory brought home a selection of ramen noodles. I am not talking about the prepackaged/all in one ramen noodles that sell for 5/1.00. These are ramen noodles sold like Italian pasta noodles. We tried fresh, frozen and dried. They were from 5 different countries. To be honest, the differences were minor but we kept going back to the Japanese brand as our favorite. The taste and texture fit with what our expectation of a ramen noodle should be like. The kids could care less...they just want ramen noodles. The Japanese ramen noodles were the most expensive so beware of price. They all have different price points and different ingredients. Some were made with 2 ingredients and others had 5-6. If this is important to you then read the labels. 1. Cut vegetables into small slices, dices or pieces. Add to broth. 2. Heat broth to very hot. We never boil the broth. Keep broth very hot until vegetables are tender. 3. In a separate pot bring desired amount of water to a boil (see noodle instructions). Add noodles and cook. Drain and add to individual bowls. Our noodles take about 6 minutes to cook. 4. 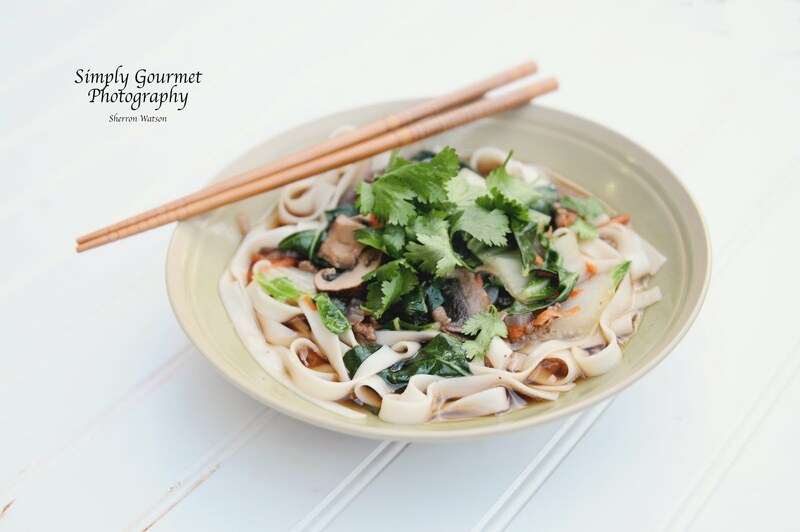 Add broth and veggies to noodles. Add any other toppings to your ramen bowl. Serve. This is a version where we used larger rice noodles and added fresh cilantro. Keepin' it different!